RAISE THE FLAG (GB) (Bay 2005-Stud 2010). Raced once. Half-brother to SW Banks Hill. Sire of SW Broadside (Newcastle Gold Cup, Gr.3), Etah James, Parthesia, Civil Disobedience, Raise You Ten, Yogi, SP Princess Brook, Chequered Flag, Unfurl and of Flag the Groom, Crispin, Larrikin, Perceptive, Ubin Thunderstruck, Ablaze, Blue Flag, Hilarious, Tommyra, Orepuki Lad, Slammer, Barclay Creek, Countess Ruby, Delegate, Flagdown, Hoist, etc. Smackdown (g. by Towkay). 5 wins to 1300m, NZ$6,250, A$213,175, Swan Hill JC Golden Topaz, MRC Isuzu Australia H., 2d Swan Hill JC Golden Topaz H., MRC Sportingbet H., Le Pine Funerals H., 3d MRC Le Pine Funerals H., Swan Hill JC Golden Topaz H., VRC Singapore Turf Club H.
Flippant (g. by Black Tuxedo). 5 wins at 1400m, 1600m, Hawkes Bay Desert Gold Club H., 3d Wanganui JC AME Electrical H.
Ubin Thunderstruck (g. by Raise the Flag). 3 wins. See below. Charlie Horse (g. by Zacinto). 2 wins at 1600m, 1800m in 2017-18, Taranaki RC MD Brown Plumbing S.
Kings Daughter (f. by Shinko King). Winner at 1400m in NZ. Black Anna. Winner. See above. Guest Performer. 10 wins from 1200m to 1600m in Aust. Meribel. Winner at 2100m in NZ. LORD REIMS (Zamazaan). Top of The 1987-88 Australasian 4YO+ Classification (2100m+). 13 wins from 1200m to 3200m, NZ$36,045, A$1,009,212, VATC Caulfield Cup, Gr.1, SAJC Adelaide Cup, Gr.1-3 times, West End Export S.H., Gr.3-twice, STC Lord Mayor's Cup, L, ARC Chase H., 4th STC HE Tancred International S., Gr.1. INSTANT POLICY (Grosvenor). 18 wins from 1200m to 2000m, A$228,795, Darwin Cup, L, SAJC Tattersall's Cup, L, VRC KA Morrison H., SAJC Tango Miss H., Australia Florist H., 2d SAJC Tattersall's Cup, L, 3d MVRC Airport H., VRC Bitalli Welter H.
Miss O'Brien (Fastnet Rock). 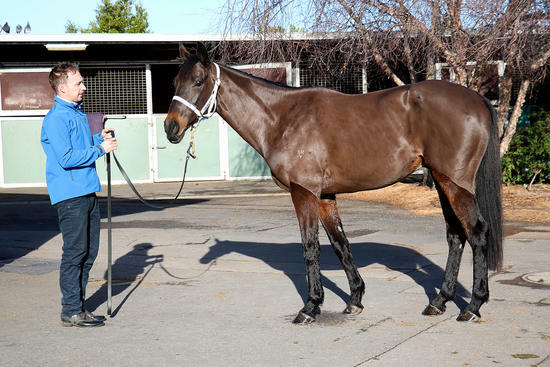 Winner at 1200m, 2d VRC Nouvelle Star H., Long Tan H., 3d VRC Talindert S., L, Rainburst 2YO P. Producer. SAVOUREUX (Nadeem). 6 wins-1 at 2-to 1250m, A$391,485, ATC Wenona Girl H., Gr.3, BRC Mode P., L, ATC Tab.com.au H., Cellarbrations H., 2d ATC Cal Rei H., Shop With the TAB App H., 3d ATC Triscay S., Gr.3, Newcastle JC Tibbie S., Gr.3, ATC Turf Club H., ClubsNSW H.
ROCKET RACER (Balmerino). 7 wins from 1200m to 3200m, A$276,115, WATC Perth Cup, Gr.1, Tattersall's Cup, L, QTC Graduation S., WATC Graduation S.-twice, 2d WATC CB Cox S., Gr.2, GA Towton Cup, L, 4th WATC Queen's Cup, Gr.3. STARZAAN (Zamazaan). 3 wins from 1400m to 2400m, US$4,125, A$85,520, AJC Oaks, Gr.1, AJC Princess H., L, Ambarvale H., 2d AJC Pretty Polly S., 3d STC Merrylands H.
CHIMING KNIGHT (Sir Tristram). 5 wins from 1900m to 2600m, STC Lord Mayor's Cup, L, AJC Karendi H.
THEATRE OF DREAMS (Rhythm). 9 wins from 1600m to 3200m, R461,200, Turffontein Caradoc Gold Cup, Gr.3, 3d Turffontein Gold Bowl, Gr.2, 4th Greyville Gold Vase, Gr.2, Newmarket Racing Association H., Gr.3. DANCES ON STARS (Snitzel). 9 wins-1 at 2-from 1100m to 1600m, A$768,710, to 2017-18, ATC Kindergarten S., Gr.3, 2d BRC Queensland Guineas, Gr.2, 3d ATC Ajax S., Gr.2, BRC Sires' Produce S., Gr.2. CAVALLO (Bellissimo). 3 wins from 1500m to 2000m, VRC Tetley Tea Bag S.H., L, 3d VRC Carbine Club S., L.
OMEGA CODE (Saumarez). 8 wins-1 at 2-from 1400m to 3600m, R378,265, Fairview Port Elizabeth Gold Cup, L, Kenilworth Chairman's Cup, L.
(OUR) SMALL TOWN BOY (Danasinga). 5 wins from 1400m to 2300m, NZ$98,925, A$2,000, Manawatu Cup, Gr.3, Taranaki RC Budget Rental Cars H., WRC Tote Pub & Pizza Furnace H., 3d Marton Cup, L.
Race Record: 13 Starts 3-1-1 A$63,670. 3 wins from 1600m to 2400m to 2017-18, MRC Le Pine Funerals H.